Successful events are result of careful planning, organizing and team work. Leadership opportunities were plenty. Volunteers raised their hands. The result, two very successful events, Boot Camp and COT(Club Officer Training) The team members who went above and beyond to make the event a success are Chizanda, Tamika, Angie, Ibrahim, Mali, Tissah, Mwape, Irene, Noah and Olly. On 18.01.2019, we had our first leadership and Communication Boot Camp! With exceptional speakers and very supportive sponsors. On 19.01.2019 we had our second Club Officer training with all the clubs being well represented, edging us closer to higher quality clubs in 2019. I am humbled by the invaluable support we received from the District and Division teams and above all, the Zambian Clubs that are hungry and driven to succeed. I was deeply touched. We invited over 5 Corporates including staff and students from the Copperbelt University(CBU). CBU hired a bus and drove 7 hours from the Copperbelt to Lusaka to attend Boot Camp and COT2. I have observed a fundamental lesson of team work. One can give birth alone, but it is much more interesting when there is someone to hold the head of the newly born baby or cut the umbilical cord, among other details that follow just after birth. I haven’t been to a grave yard yet, but I have watched many movies that involved the burial of a deceased person, and I have never seen a dead person jumping down into his or her own grave. What I saw were tender hands from people who placed the deceased body into the grave and even going the extra mile to place blossomed flowers to honor the deceased. The point is, life begins with birth and ends with death. Both processes involving others, at birth we come into people hands and after death people’s hands carry us to our last resting place. If there is anything significant to be done, it must be done with people and for people. We worked as teams to service our members and displayed a great show of leadership and service. Nevertheless, we could not have done so without the amazing support of our facilitators who committed all the way from Zimbabwe and Johannesburg to be present for our members, that’s exemplary leadership. We will forever be grateful to our sponsors who made this dream come through. The venue, accommodation and even air fares were sponsored by the Zambian corporates for the people of Zambia. 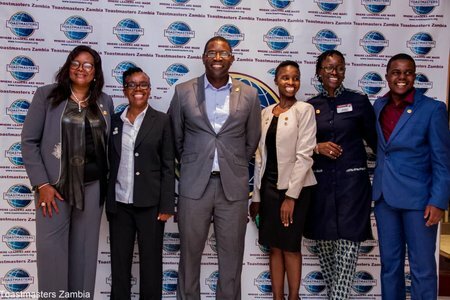 That’s a classic show case of giving back and we the Toastmasters Zambia vowed to pay it forward by delivering the promise of excellence, a fundamental value of Toastmasters International. Thank you so much to our valuable members for showing up. Both events were amazing. Many special people were supporting in the background, from Division Z, to District 74 and to our star sponsors, we appreciate you and say thank you for invaluable support. These events would not have been possible without our servant leaders DTM Edmore, DTM Linda, TM Simunza, DTM Andrew. Thank you for your teachings and Leadership during Boot Camp.Special thanks to Adolph for the inspiration and great support in the background. This is year of people making history, I have no doubt that Zambia will be making more than history but rather legacy. I know we have the right team in place to get it done. We will continue to be relentless in our efforts to ensure excellence service to our members and the growth of Toastmasters Zambia. Where do we go from here? This is the year of People Making History. What stops us from achieving the Presidents Distinguished by April? As we learnt at the COT – Nothing! We are on fire and we are on our way to achieving these goals.